You know when someone says something that sounds pretty far-fetched and you’re left thinking something like ‘ahhhhhhh… yup… OK.’? That happened to me last year at the Single Fin Mingle. On the opening night, in a carpark outside a movie theatre, a certain curly haired, cider soaked, longtime Mingle attendee told me, “as long as the Mingle runs, I’ll be here every year for the rest of my life”. ‘Every year? Big call’ I thought. ‘Biiiiig call’. Two nights later, I understood. Exhausted, hung-over and elated with a weekend of surf, arts and an inimitable atmosphere, I understood. Our cider soaked friend’s comment wasn’t far-fetched. It was heartfelt. And I was left thinking the same thing. ‘Yup. As long as the Mingle runs, I’ll be here every year for the rest of my life’. The Single Fin Mingle is upon us ladies and gentleman! It’s next weekend! 29-31 March, Sumner, Christchurch. Hello Zukeen will be there, bells and whistles. Expect some dastardly deeds from the Zukeen team on the ground. But mostly lots of Cam Hay. Anyway, we gave the founding father Ambrose McNeil a call to see what’s in stall for us this year. So, three weeks until the Single Fin Mingle. Damn right. It’s heating up to be an absolute ripper of a year. I cannot wait. The Mingle is a lot more than a longboarding competition. Indeed. It’s far more than that. The longboard contest itself is merely a focal point to bring everybody together, to get us together at the beach. But really, we’ve built the event around all the social activities and the festival atmosphere that’s created around that - the wearing of the old school suits, the parties, the music, the films - they are all the things that make the Mingle so special I think. And we’re really trying to build the festival vibe of it each year, so trying to create the atmosphere more and more. And although the competition is important, we really want people to show off and have their chance to shine and show off infront of their friends, we don’t want it to become ultra competitive you know? 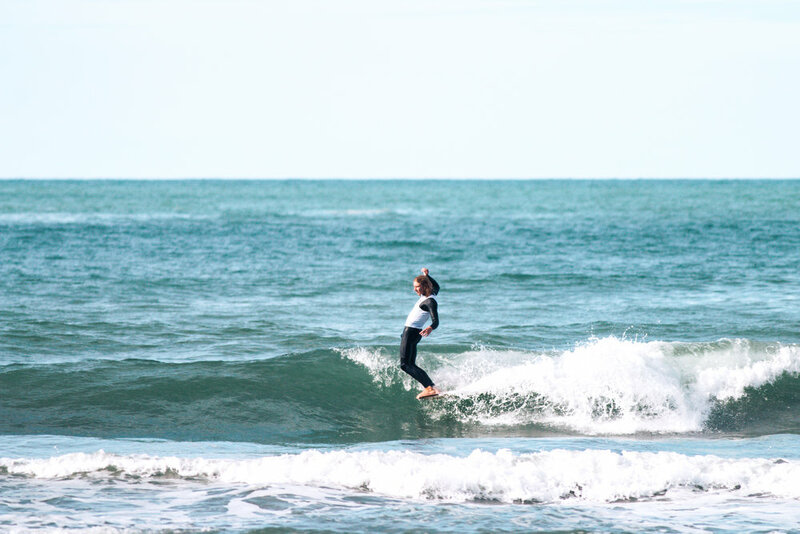 Those contests exists, ours is a chance for those surfers to show off their talents and celebrate their talents, but still not in really a competitive way. And we make a point of that at the start of the event - you won’t win the contest if you go home from the party early. A big theme at the Mingle is jazz. Yup it is. And I think jazz music has always gone hand in hand with longboard surfing especially. And I could probably talk until I’m blue in the face about that and sound a little bit pretentious, but it’s really that kind of improvisation of jazz music that lends itself to longboarding. Everyone is doing their own thing, they’ve got their own style and their own take on it. And that’s where they marry quite nicely I think. So we really try to incorporate that throughout the event - playing it over the PA while the surfers are surfing and we have jazz concerts at the opening night and the final night as well. So surfing and jazz in the day time and then you’ve got the big party night on Saturday night. What will be going down? Jazz by day, but once the sun goes down, the tempo starts to increase somewhat and this year’s party is going to be huge. We’re expecting everyone to have a real doozy of a time. We’ve got our favorite friends The Butlers - who we’ve aptly called ‘The Single Fin Mingle House Band’ - we’ve had them play at every Single Fin Mingle. We figure why stop now when they’re blowing up across NZ? So they’re going to open before we roll out China Beach, an amazing soul, funk band coming all the way from Melbourne. They’re going to be something. I heard them at Noosa last year and immediately thought that they were made for the Mingle. So I’m really excited about that. Exciting. Each year the Mingle attracts some of the best longboarders in the world. What surfers are you most excited to see at the Mingle? There’s some big names. I guess that’s what I love about the Mingle - seeing all this talent coming from around the world, but then watching my best mates surf against them and do so well also. So yeah, we’ve got some talent coming from all across America, all across Europe, Hawaii and we’ve got a world champion, a 2017 world longboard champion coming. I’m really excited to see her surf against No-Good-Nina to be honest. There’s always lots of talented lady loggers which is great. The girls are a big part of the Mingle to make it what it is. Without them it would be very boring wouldn’t it? Yeah and quite frankly they look better on a longboard than guys do. OK. Let’s wrap this up. 5 reasons to visit the Mingle this year. Quickfire. OK. 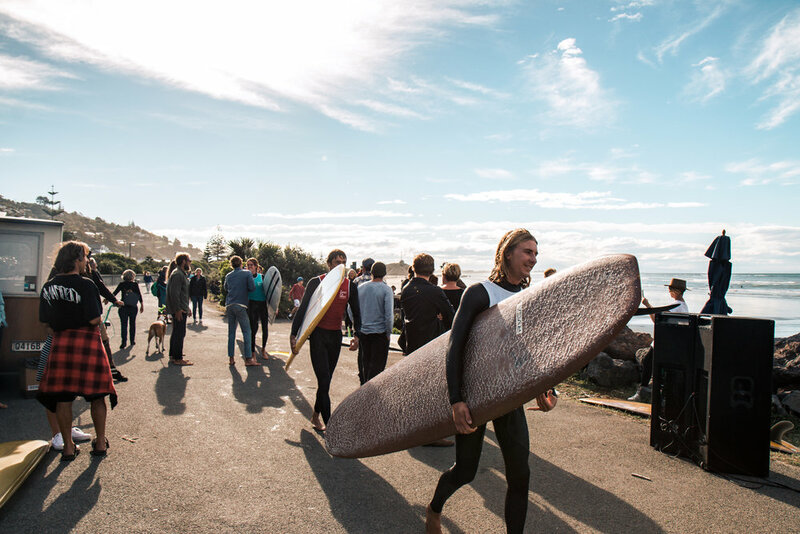 Number one - the best surfers that NZ has ever seen in one place. I mean, maybe minus the time Joel Parkinson, Andy Irons and all this other crew did this demo at Piha. Number two - amazing beachside vintage surf fashion on Sumner Esplanade. Number three - world class art in the way of Californian artist Ty Williams showing his artwork at Le Strange gallery for the first time in NZ. Number four, the best party that Sumner has ever seen. Big call, but confident. And Number five - to buy amazing Mingle merch off my mum Melissa. And that’s a wrap. See you at the Mingle!